In 1988, Tilda Swinton toured round the Berlin Wall on a bicycle, accompanied by filmmaker Cynthia Beatt. Starting and ending at the Brandenburg Gate, Swinton leads us on a journey that is by turns idyllic, surreal, whimsical and depressing. As she travels through fields and historic neighborhoods, past lakes and massive concrete apartment complexes, the Wall is a constant presence - in the landscape, but not of it. The Wall cuts stately homes off from the lake beside them, offers up a graffiti-scrawled face adjacent to sombre architecture and pastoral lanes, and mars the Brandenburg Gate, leading Swinton to opine that "This is completely mad, this place." 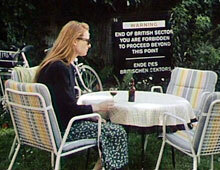 Swinton is no passive tourist. She provocatively takes a Polaroid of an East German guard tower and waves the photo for the guards. She pauses to pick wispy grasses under the eyes of another tower. She recites poetry. CYCLING THE FRAME is a fascinating historical document, made all the more powerful when we realize that the Wall - seemingly so solid and permanent - would be breached only a year later, and vanish soon after. As Swinton gazes at the concrete monstrosity, she prophetically recites "Oh wall, oh wall, oh little wall. It would be funny if you would fall, and people could over you step and go about their business." Little could she know how quickly her rhyme would become reality. CYCLING THE FRAME is then the precursor to THE INVISIBLE FRAME, the new film in which Swinton and Beatt revisit the 160-kilometre bike tour 21 years later, this time marked by the absence of the Wall. Together, the two documentaries offer a poetic and compelling portrait of two eras. 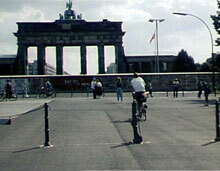 The Invisible Frame: A filmic journey starring Tilda Swinton as she traces the former Berlin Wall via bicycle. 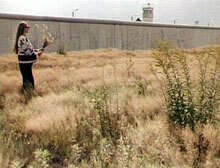 Rabbit � la Berlin: 2010 Academy Award Nominee, Best Documentary Short Subject. The history of the Berlin Wall from the rabbits' point-of-view. The Seasons in Quincy: Four Portraits of John Berger: A multi-faceted portrait of artist, philosopher, writer, storyteller and "radical humanist" John Berger.